Tax withholding can be complicated, and with the passage of the Tax Cuts and Jobs Act (TCJA) legislation, it’s even more so since a number of tax provisions have changed. As such, it’s important to make sure the right amount of tax is withheld for your particular tax situation. Many taxpayers have already adjusted their withholding, but for those with more complicated tax situations who have been putting it off, it’s not too late. You should be aware, however, that the longer you wait, the fewer pay periods there are to withhold the necessary federal tax. In other words, more tax will have to be withheld from each remaining paycheck. Let’s take a look at which taxpayers would benefit from a “paycheck checkup” right now to avoid an unexpected tax bill next year. Taxpayers who typically adjust their tax withholding so that they receive a large refund at tax time could be affected by tax law changes in the TCJA including reduced tax rates and significantly different tax brackets, as well as the removal of personal exemptions and doubling of the standard deduction. Adjusting tax withholding now will help taxpayers make sure the amount withheld is best for their particular tax situation–and avoid an unpleasant tax surprise next year. Changes to tax rates and brackets. Expansion of the child tax credit. The standard deduction nearly doubled to $24,000 for joint filers and $12,000 for singles. A $10,000 cap on deductions for state and local property, sales and income taxes. New limits on deductions for some mortgage interest and home equity debt. Higher limits on the percent of income a taxpayer can deduct as charitable contributions. No deductions for miscellaneous expenses including investment expenses and unreimbursed employee expenses such as travel, meals, entertainment and uniforms. It is especially important for those with high incomes and complex returns to review withholding because these taxpayers are often affected by more of these changes than people with simpler returns. This is also true if they also make quarterly estimated tax payments to cover other sources of income or are subject to the self-employment tax or alternative minimum tax. In addition to expanding the Child Tax Credit, the TCJA added a new tax credit for parents or other qualifying relatives supporting a dependent age 17 or older at the end of 2018. This new tax credit – Credit for Other Dependents – is a non-refundable credit of up to $500 per qualifying person. This change, along with others, can affect a family’s tax situation in 2018 and it’s important to check and adjusted withholding amounts if necessary to prevent an unexpected tax bill and even penalties next year at tax time. Tip: Families with qualifying children under the age of 17 should first review their eligibility for the expanded Child Tax Credit, which is larger. Taxpayers should also note that both credits begin to phase out at $400,000 of modified adjusted gross income for joint filers and $200,000 for other taxpayers. Because the U.S. tax system operates on a pay-as-you-go basis, taxes must be paid on income as it is received rather than at the end of the year. Generally, people who are part of the sharing economy and who do not have an employer need to make sure they pay their taxes either through withholding from other jobs they may have or by making quarterly estimated tax payments to cover their tax obligations. Underpayment of taxes is a common scenario with more than 10 million taxpayers facing a penalty for underpayment of estimated tax last year alone. Tax is typically withheld for most people who receive salaries, wages, pensions, unemployment compensation and the taxable part of Social Security benefits. However, with numerous changes to the tax system due to tax reform many taxpayers may need to adjust withholding on their paychecks or the amount of their estimated tax payments to help prevent penalties. While most income is subject to tax withholding, some income from self-employment or rental activities is not. Furthermore, individuals, including sole proprietors, partners, and S corporation shareholders, may need to make estimated tax payments unless they owe less than $1,000 when they file their tax return or they had no tax liability in the prior year (subject to certain conditions). As a reminder, in the U.S. taxes are required to be paid as income is earned or received during the year. The TCJA also changed the way tax is calculated for retirees, many of whom have income from pensions and annuities. As such, retirees who receive a monthly pension or annuity check may need to raise or lower the amount of tax they pay during the year. Retirees should treat their pension similar to income from a job. Pension recipients that need to change their withholding can do so by filling out Form W-4P and submitting it to their payer. Retirees should submit Forms W-4P to their payers as soon as they can to give payers enough time to apply any changes to withholding to as many payments as possible this year. Note: Because it is already November, some retirees may be unable to cover their expected tax liability through withholding, and could instead make estimated or additional tax payments directly to the IRS. Please call if you need more information about this option. If you have any questions about Form W-4 or need to make adjustments to your withholding, don’t hesitate to contact the office and speak to a tax professional you can trust. The first decision you will need to make is determining which business structure you will use. The most common types are a sole proprietor, partnership and corporation. The type of business you choose will determine which tax forms you file. Securing an Employer Identification Number (also known as a Federal Tax Identification Number) is the first thing that needs to be done since many other forms require it. The IRS issues EINS to employers, sole proprietors, corporations, partnerships, nonprofit associations, trusts, estates, government agencies, certain individuals, and other business entities for tax filing and reporting purposes. Note: Even if you already have an EIN as a sole proprietor, for example, if you start a new business with a different business entity you will need to apply for a new EIN. The fastest way to apply for an EIN is online through the IRS website or by telephone. Applying by fax and mail generally takes one to two weeks, and you can apply for one EIN per day. There is no cost to apply. Once you have your EIN, you need to fill out forms to establish an account with the State for payroll tax withholding, Unemployment Insurance Registration, and sales tax collections (if applicable). Business taxes include income tax, self-employment tax, employment tax, and excise tax. Generally, the types of tax your business pays depends on the type of business structure. Keep in mind that you may also need to make estimated tax payments. Form W-4, Employee’s Withholding Allowance Certificate. Completed by the employee and used to calculate their federal income tax withholding. This form also includes necessary information such as address and Social Security number. Form I-9 Employment. Eligibility Verification. Completed by the employer, to verify that employees are legally permitted to work in the U.S.
As an employer with employees, you may have certain healthcare requirements you need to comply with as well. If so, you should know about the Small Business Health Care Tax Credit, which helps small businesses (fewer than 25 employees who work full-time, or a combination of full-time and part-time) pay for health care coverage they offer their employees. The maximum credit is 50 percent of premiums paid for small business employers and 35 percent of premiums paid for small tax-exempt employers, such as charities. If you employ someone to work for you around your house, it is important to consider the tax implications of this type of arrangement. While many people disregard the need to pay taxes on household employees, they do so at the risk of paying stiff tax penalties down the road. If a worker is your employee, it does not matter whether the work is full-time or part-time or that you hired the worker through an agency or from a list provided by an agency or association. It also does not matter whether you pay the worker on an hourly, daily or weekly basis or by the job. If the worker controls how the work is done, the worker is not your employee but is self-employed. A self-employed worker usually provides his or her own tools and offers services to the general public in an independent business. Example: You pay Jane to babysit your child and do light housework four days a week in your home. Jane follows your specific instructions about household and childcare duties. You provide the household equipment and supplies that Jane needs to do her work. Jane is your household employee. Example: You pay Roger to care for your lawn. Roger also offers lawn care services to other homeowners in your neighborhood. He provides his own tools and supplies, and he hires and pays any helpers he needs. Neither Roger nor his helpers are your household employees. When you hire a household employee to work for you on a regular basis, he or she must complete USCIS Form I-9 Employment Eligibility Verification. It is your responsibility to verify that the employee is either a U.S. citizen or an alien who can legally work and then complete the employer part of the form. It is unlawful for you to knowingly hire or continue to employ a person who cannot legally work in the United States. Keep the completed form for your records. Do not return the form to the U.S. Citizenship and Immigration Services (USCIS). If you have a household employee, you may need to withhold and pay Social Security and Medicare taxes, or you may need to pay federal unemployment tax or both. If you pay cash wages of $2,100 or more in 2018 to any one household employee, then you will need to withhold and pay Social Security and Medicare taxes. Also, if you pay total cash wages of $1,000 or more in any calendar quarter of 2017 or 2018 to household employees, you are also required to pay federal unemployment tax. If neither of these two contingencies applies, you do not need to pay any federal unemployment taxes; however, you may still need to pay state unemployment taxes. Please contact the office if you’re not sure whether you need to pay state unemployment tax for your household employee. A tax professional will help you figure out whether you need to pay or collect other state employment taxes or carry workers’ compensation insurance. Social Security taxes pays for old-age, survivor, and disability benefits for workers and their families. The Medicare tax pays for hospital insurance. Both you and your household employee may owe Social Security and Medicare taxes. Your share is 7.65 percent (6.2 percent for Social Security tax and 1.45 percent for Medicare tax) of the employee’s Social Security and Medicare wages. Your employee’s share is 6.2 percent for Social Security tax and 1.45 percent for Medicare tax. You are responsible for payment of your employee’s share of the taxes as well as your own. You can either withhold your employee’s share from the employee’s wages or pay it from your own funds. (b) you are divorced and have not remarried, or you are a widow or widower, or you are married to and living with a person whose physical or mental condition prevents him or her from caring for your child for at least four continuous weeks in a calendar quarter. As you can see, tax rules for hiring household employees are complex; therefore, professional tax guidance is highly recommended. This is definitely an area where it’s better to be safe than sorry. If you have any questions at all, please contact the office to set up a consultation. When it comes to retirees, relocating, and taxes there are a number of factors to consider– including the overall tax burden. As you’ve read here, not all states are created equal. If you’re thinking about retiring to another state, please contact the office and make an appointment with a tax professional who will help you figure out which state fits your particular circumstances. If you’re thinking of starting a nonprofit organization, there are a few things you should know before you get started. First, is understanding how nonprofits work under state and federal law. For example, two things you should understand is that state law governs nonprofit status. Nonprofit status is determined by an organization’s articles of incorporation or trust documents while federal law governs tax-exempt status (i.e., exemption from federal income tax). Whether you’re starting a charity, a social organization, or an association here are the steps you need to take before you can apply for tax-exempt status. 1. Determine the type of organization. A trust is defined as a relationship in which one person holds title to property, subject to an obligation to keep or use the property for the benefit of another. It is formed under state law. A corporation is formed under state law by the filing of articles of incorporation with the state. The state must generally date-stamp the articles before they are effective. An association is a group of persons banded together for a specific purpose. To qualify under section 501(a) of the Code, the association must have a written document, such as articles of association, showing its creation. At least two persons must sign the document, which must be dated. The definition of an association can vary under state law. Organizations that do not have an organizing document will not qualify for exempt status. If the organization’s name has been legally changed by an amendment to its organizing documents, they should also attach an exact copy of that amendment to the application. State law generally determines whether an organization is properly created and establishes the requirements for organizing documents. Next, you will need to take a look at your state’s registration requirements for nonprofits. State government websites have useful information for tax-exempt organizations such as tax information, registration requirements for charities, and information for employers. 4. Obtain Employer ID numbers. Finally, once your organization is legally formed you will need to obtain employer id numbers (EINs) for your new organization. Organizations can apply for an EIN online, by fax, or by mail using Form SS-4, Application for Employer I.D. Number. International applicants may apply by phone. Third parties can also receive an EIN on a client’s behalf by completing the Third Party Designee section. Don’t forget to have the client sign the form to avoid having to file a Form 2848, Power of Attorney, or Form 8821, Tax Information Authorization. One final thing to note, is that nearly all organizations are subject to automatic revocation of their tax-exempt status if they fail to file a required return or notice for three consecutive years. Once an organization applies for an EIN, the IRS presumes the organization is legally formed and the clock starts running on this three-year period. Questions about starting a nonprofit? Help is just a phone call away. The IRS is offering tax relief to any area designated by the Federal Emergency Management Agency (FEMA), as qualifying for individual assistance. Currently, this only includes parts of North Carolina, but taxpayers in additional localities (and states) may be added to the disaster area later and will automatically receive the same filing and payment relief. Taxpayers may call the office or visit the disaster relief page on the IRS website to check the current list of eligible localities. The tax relief postpones various tax filing and payment deadlines that occurred starting on September 7, 2018, in North Carolina. Businesses and individual taxpayers affected by Hurricane Florence in North Carolina and elsewhere have until January 31, 2019, to file certain individual and business tax returns and make certain tax payments that were originally due during this period. These tax payments include quarterly estimated income tax payments due on September 17, 2018, and the quarterly payroll and excise tax returns that are normally due on September 30, 2018. Taxpayers who had a valid extension to file their 2017 return due to run out on October 15, 2018, will also have more time to file. Businesses with extensions also qualify for the additional time including those who were expected to file calendar-year partnerships (i.e., those whose 2017 extensions run out on September 17, 2018). Penalties on payroll and excise tax deposits due on or after September 7, 2018, and before September 24, 2018, will also be abated as long as the deposits are made by September. 24, 2018. Tax relief is part of a coordinated federal response to the damage caused by severe storms and flooding and is based on local damage assessments by FEMA. If you have any questions or need assistance, don’t hesitate to call. For tax years prior to 2018, employees could exclude from income moving expenses reimbursed or paid by an employer. However, due to the passage of the Tax Cuts and Jobs Act (TCJA) last year, this tax provision has been suspended starting this year. This means, that going forward, these amounts are considered taxable income with one exception: amounts reimbursed to active-duty members of the U.S. Armed Forces whose moves relate to a military-ordered permanent change of station. However, the IRS recently clarified that payments or reimbursements made by employers in 2018 for employees’ moving expenses incurred in 2017 (or prior years) will be excluded from the employee’s wages for income and employment tax purposes. This holds true if the employer pays a moving company in 2018 for qualified moving services provided to an employee prior to 2018 as well. To qualify, reimbursements or payments must be for work-related moving expenses that would have been deductible by the employee if the employee had directly paid them prior to January 1, 2018. That is, the employee must not have deducted them in 2017. Employers that have already treated reimbursements or payments as taxable should follow the normal employment tax adjustment and refund procedures. Please call the office if you have any questions about this topic. Every business owner, no matter how small, must keep good records. But whether it’s keeping track of mileage, documenting expenses, or separating personal from business use, keeping up with paperwork is a seemingly never-ending job. No matter how good your intentions are in January, the chances are good that by now that paper mileage log is looking a bit empty. Even worse, you could be avoiding tracking your mileage altogether–and missing out on tax deductions and credits that could save your business money at tax time. The good news is that there are a number of phone applications (apps) that could help you track those pesky business miles. Most of these apps are useful for tracking and reporting expenses, mileage and billable time. They use GPS to track mileage, allow you to track receipts, choose the mileage type (i.e., business, personal), and produce formatted reports that are easy to generate and share with your CPA, EA, or tax advisor. Premium Office 365 subscribers can log unlimited drives every month. If you have any questions about using apps that track business mileage or need help choosing the right one for your business needs, don’t hesitate to call. 1. An IRS levy permits the legal seizure and sale of property to satisfy a tax debt. For purposes of a levy, the term “property” includes wages, money in bank or other financial accounts, vehicles and real estate. 2. The time frames apply when the IRS has already sold the property it levied. Taxpayers can make an administrative claim for return of their property within two years of the date of the levy. Twelve months from the date the person filed the claim. Six months from the date the IRS disallowed the claim. 4. The change in law applies to levies made before, on or after December 22, 2017, as long as the previous nine-month period hadn’t yet expired. 5. Anyone who receives an IRS bill titled, Final Notice of Intent to Levy and Notice of Your Right to A Hearing, should immediately contact the IRS. By doing so, a taxpayer may be able to make arrangements to pay the liability, instead of having the IRS proceed with the levy. Questions about IRS levies? Help is just a phone call away. What do you do when an application you are using stops meeting your growing needs in a specific area? You can: a.) find a workaround, b.) switch to different software, or, c.) resign yourself to living without that feature. Fortunately, QuickBooks offers a fourth option: d.) find an integrated add-on app that will work for you. With hundreds of these add-on apps available, it’s likely you will find one that will do just what you need. Integrated add-on apps fall into several categories, ranging from billing and invoicing to Customer Relationship Management (CRM) to inventory management to time-tracking. There are special versions designed to work with QuickBooks, and they require a monthly subscription fee. From receipt tracking through reimbursement, Expensify automates the process of managing expense reports. 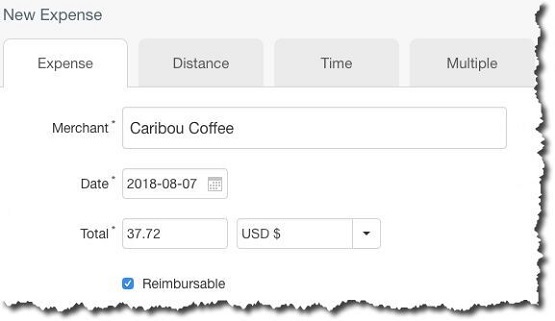 You snap photos of receipts, and the site’s built-in intelligence will read them and enter details like merchant, date, and price in the system’s own forms. If you need to record vehicle mileage, Expensify can do that by using your smartphone’s GPS. Other features include compatibility with global currencies and taxes; notifications of travel itinerary changes; “smart” receipt-auditing (ensuring that your expense policies are enforced); and direct deposit reimbursements. Figure 1: You can enter expenses manually in Expensify or take a photo with your phone. The site will read the receipt and transfer critical data to forms in the app. The service offers three price levels for small business. For $5 per user/month, you get tools that enable basic expense approval and online reimbursements. A Corporate subscription gives you that, plus advanced policy support, corporate card reconciliation, and a multi-staged approval workflow, for $9 per user/month. method:CRM was actually built exclusively for QuickBooks users. It expands on the customer management tools found in QuickBooks and supports two-way synchronization. You can see real-time customer, lead, and vendor data in either application; automate lead-collection and lead-tracking, and service customers far more efficiently than with QuickBooks alone. The application saves time by streamlining workflows and eliminating duplicate data entry, and its customer and vendor portals provide safe online spaces where you and your contacts can interact, view transactions and other information, and make payments. After a 30-day free trial, you can subscribe to one of two levels. 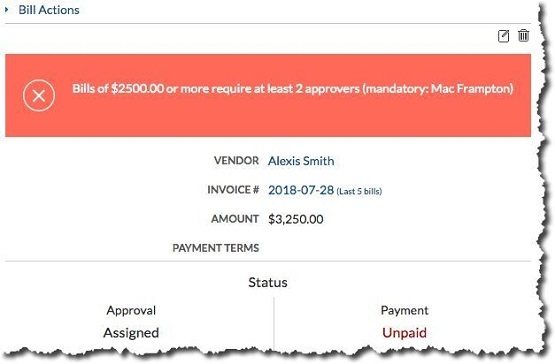 The Contact Manager version ($28 per user/month or $25 if paid annually) offers everything except the ability to create QuickBooks sales transactions, accept online payments, and track your sales pipeline. These tools are included in CRM Pro ($49 per user/month or $44 if paid annually). Some services are available a la carte. If you only process a couple of dozen bills and invoices every month, QuickBooks may be all you need. But if you have complex, transaction-heavy accounts receivables and payables that are difficult to track, you might want to consider Bill.com. A web-based application that integrates very well with QuickBooks, Bill.com is all about automation. It offers multiple ways to get your sales and expense documents into a digital format (scan, fax, email, smartphone photo) and then follows your directions as it routes them to the appropriate employees for approval. You’ll make and receive payments electronically and always know where you stand with customers and vendors, thanks to a simple, understandable user interface and navigation scheme. Figure 2: Once you create approval policies within Bill.com, the application enforces them. Pricing starts at $39 per user/month, which includes accounting software integration and your choice of payable or receivable support. You can get both for $59 per user/month – plus advanced automation and approver options. If the integrated apps we described here sound too complicated for you, you may not need them. Or perhaps you do need them, but you’re not sure you could master them easily. If so, contacting a QuickBooks pro from the office is the first step. First, they will determine whether you’re using all of QuickBooks’ own tools in the problem areas you have identified. Next, the QuickBooks pro will introduce you to all of the options in that category and help you get up and running. QuickBooks was designed for small business people, but that doesn’t mean that you’re going to understand all of its parts and how they work together instantly. If you have questions, don’t hesitate to contact the office for assistance. Employees who work for tips – If you received $20 or more in tips during September, report them to your employer. You can use Form 4070. Individuals – If you have an automatic 6-month extension to file your income tax return for 2017, file Form 1040, 1040A, or 1040EZ and pay any tax, interest, and penalties due. Corporations – File a 2017 calendar year income tax return (Form 1120) and pay any tax, interest, and penalties due. This due date applies only if you timely requested an automatic 6-month extension, Otherwise, see April 17, earlier. Employers Nonpayroll withholding. If the monthly deposit rule applies, deposit the tax for payments in September. Employers Social Security, Medicare, and withheld income tax. If the monthly deposit rule applies, deposit the tax for payments in September. Employers – Social Security, Medicare, and withheld income tax. File form 941 for the third quarter of 2018. Deposit any undeposited tax. (If your tax liability is less than $2,500, you can pay it in full with a timely filed return.) If you deposited the tax for the quarter in full and on time, you have until November 13 to file the return.